The river above Miller’s Ferry comprises two really big loops. This is one only two areas where Corps dams have flooded outside of the channel on the Alabama R. I thoroughly enjoyed staying well out of the channel this morning because it gave me a bit of a shortcut, allowed me to avoid some headwind, and took me into the haunts of dozens of white pelicans and hundreds of anhingas. I tried something new today, and it worked very well. I put the Jetboil and a Mountain House freeze dried meal in my ready bag in the boat. When I had paddled around the biggest loop against a headwind and began to have favorable winds, I cooked a big meal for lunch in the boat as I sailed. It worked like a champ and allowed me to keep moving. Willie Snell stopped by to see me today. Around 3:00, a boat passed me, slowed, and reversed course to pull up alongside me. It was Willie. We had a nice little chat and it gave me a chance to thank him again for taking me to town. Nice man. 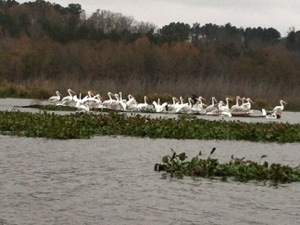 White pelicans (Pelecanus erythrorhynchos). These birds fish while swimming rather than diving as brown pelicans do. Bobby & I enjoyed meeting and visiting with you this morning after you passed through Gees Bend. I look forward to following your progress. We attempted to catch up with you this afternoon but Bobby’s boat developed an engine problem about 10 miles up-river – near Cedar Creek – and we were forced to turn around. I’m sure we were no more than a mile or two behind you. Our trip back was at 7 mph – not nearly as fun as when we enjoyed 100 miles on the Tombigbee at the same pace on a trip to Demopolis! Good luck on the remainder of your adventure. It was great chatting with you both this morning. The gift of wine and the beautiful wooden corkscrew and closure set was exceptionally generous and greatly appreciated. I do hope to cross paths with you again. My best regards to you and to Bobby. Thank him for me for the breakfast offer, please. Your cooking on the move sounds a good way of saving time.. good to see that your are progressing well and enjoying the changing scenes from day to day. Christmas is on its way … safe journey…best wishes from Dave and Lena in Dawlish UK. Cooking on the move while going upriver only works when I have enough wind and in a favorable direction that I can sail upriver faster than the downriver current. With all of the portages ahead of me (9), I plan to leave the sail and its accessories home to lighten the portage loads, so lunch on the move is about to end on this trip. It was nice to work the process out, though.